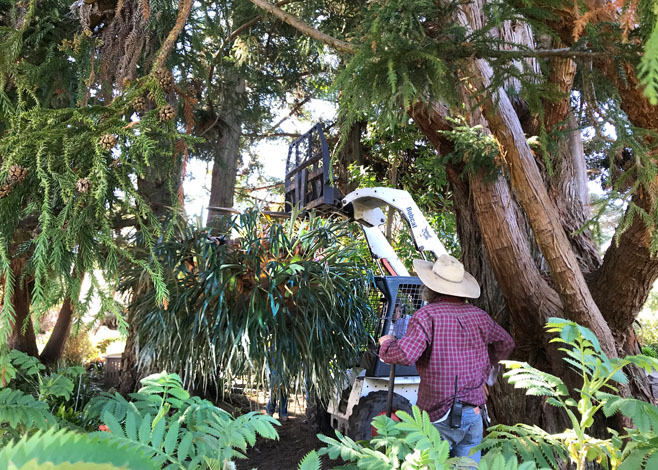 An unusually large, award-winning epiphytic fern has found a new home at the Mendocino Coast Botanical Gardens (MCBG). 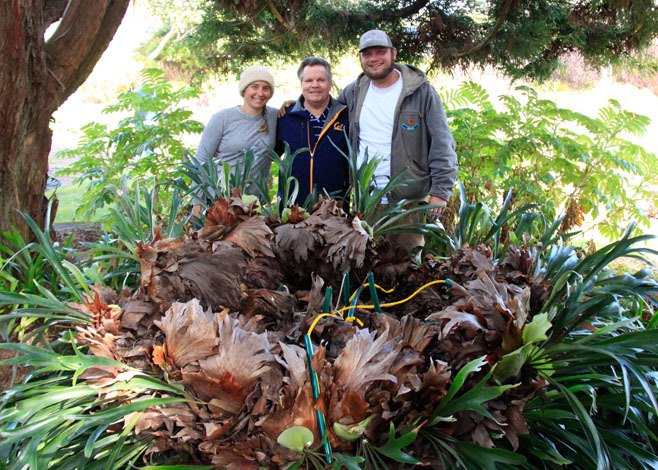 John and Monique Ziesenhenne gifted the 51-year-old Platycerium bifurcatum, or staghorn fern, after reaching out to the garden community. They sought an organization that would keep the fern intact as an educational display for the public. The couple chose MCBG from a number of interested gardens and arboretums as the most suitable recipient for the impressive specimen. The fern thrived under John’s care, winning “Best in Show” at the San Francisco County Fair Flower Show in 1979 and again in 1983. With a perfect record, John decided to retire the staghorn under the shade of a magnolia tree where it remained until its move to Fort Bragg, California. The staghorn fern is an exciting addition to the MCBG, where you’ll find it suspended in a stand of Cryptomeria japonica at the west end of the Perennial Garden. 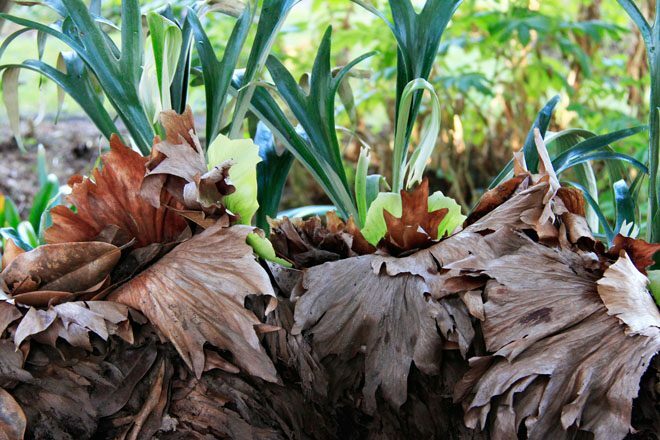 Dramatic, fertile fronds that vaguely resemble forked antlers give rise to the staghorn fern’s common name. Infertile shield fronds wrap the base of the plant and are another visually stunning attribute. The shield fronds help regulate moisture and catch nutrient-rich debris falling from the forest canopy in its native environment. Staghorn ferns are epiphytes, meaning they grow on the surface of another plant. Unlike parasitic plants, epiphytes do not derive nutrients from the host plant, but take in moisture and nutrients from rain and the surrounding environment. Mendocino Coast Botanical Gardens is a unique natural treasure located on coastal bluffs in Northern California. For the past 57 years, MCBG has cultivated a wide array of plants that are both sustainable and beautiful. Collections and highlights include rhododendrons, fuchsias, magnolias, heaths, heathers, dahlias, heritage roses, conifers, mushrooms, and more.